You can leave this page empty without any locations, and this option will disappear from other pages and also from your front-end website. If you decide to add it, it will be automatically added to all your employees because it is the only one. You need to know that location is connected to the employees, so if you have more than one location, in the employee modal this option will become mandatory to select. Now, let’s see how you can add your first location. Go to the “Locations” page, click on the “Add Location” button, and like with other Amelia entities, the “New Location” modal will appear. It is required to enter the “Name” and “Address”, other parameters are optional. When you enter the “Address” you will see options to choose from, if it is one of them, choose it and you will see your map changing. 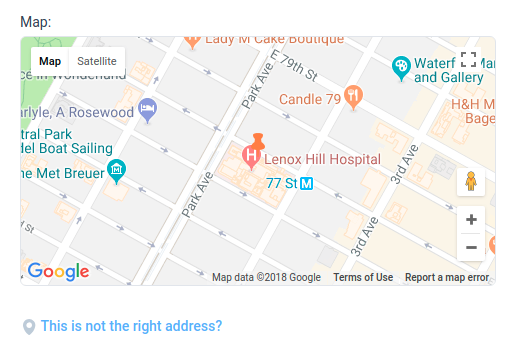 If you don’t see your desired location after entering the “Address”, under the map you will see a “This is not the right address?” button. Click on it and you will see new options to enter: “Latitude” and “Longitude”. Besides these options, you can add a picture to your location, choose a “Pin Icon”, put a “Phone” number and “Description”. After you have entered all, click on the “Save” button, dialog will close and the location will appear on the “Locations” page. Please note: If you provide services on-line or go to customers’ address but you also provide services on some location, so you need to create location for each of it, just choose some existing address so you can create the location. The address is not visible on the front-end booking forms and customers will only see the name of the location. On the “Locations” page, you will see searching and sorting options. These options are provided for companies with businesses spread across numerous locations. If your company has multiple locations, you can easily search and sort through the offices, if for example you want to make changes in one of them. You can search by a location name and a location address, filter by a service and sort by name, and in the header of the page, you can always see the total number of locations. Like on the other pages, you can also duplicate, hide or delete locations. Just open the location you would like to change and in the bottom left corner of the dialog, you will see the options. You can use the “Duplicate” button when you want to make a copy of an already created location. When creating a duplicate it is best to assign a different name to it, so that you and your customers can differentiate it from the initial one. The “Hide” option is good to use when you need to disable a certain location for a period of time, but you don’t want to delete it, as you may need it later. Just know that once you hide the location, all employees, and services connected with that location will be hidden, on the frontend booking forms of your website and also in your dialog on the back-end of the plugin. If your location doesn’t have connected employees and services, you will see a simple message for confirmation. If your location has connected employees and services, you will see a notice about how many services are connected to the location and whether you are sure you want to delete it. You should know that the main difference here is that you can delete location even though is connected with services, but your employees and future appointments will stay without an assigned location.